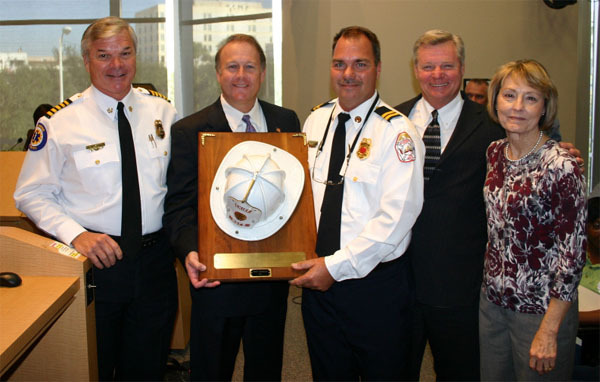 Police Chief Bill Nesmith, County Commission Chairman Ken Hagan, Captain Tracy MacDonald, Judge Chet Tharpe, and his sister, Karen Weber pose during the 2010 Chet Tharpe Firefighter of the Year Award, which McDonald received for saving a drivers life out of a submerging vehicle in a pond. The Thursday night shift started just like any other, but turned out to be the one that made fire captain Tracy MacDonald a most worthy recipient of the 2010 Chet Tharpe Firefighter of the Year Award. MacDonald’s heroism resulted in saving a life, for which he was awarded during the Hillsborough County Board of County Commissioners (BOCC) regular board meeting last month. According to county officials and area firefighters, MacDonald, is a 15-year member of the department’s special operations team, and a part of the urban search and rescue team, who currently serves at station 11 in Brandon, and has distinguished himself by his professional knowledge, leadership and devotion to duty throughout his 23-year career with Hillsborough County Fire Rescue. According to a report, on a night in January, while working at station 33, McDonald witnessed a car leave the road and go into a pond. Knowing that there was no time to waste, unselfishly and at great personal risk, McDonald went into the pond and rescued the driver of the submerging vehicle. McDonald’s quick thinking and skillful actions were instrumental in saving the driver’s life, who only suffered minor injuries. “It is believed that had Captain MacDonald not performed as he did, the woman’s life may well have been lost,” said Hillsborough County spokesperson Willie Puz. The Chet Tharpe Firefighter of the Year Award recognizes an outstanding career – or volunteer – combat firefighter, or company, for service above and beyond the call of duty. This recognition can be for acts of heroism, unusual dedication, or a significant program for our public safety. The board first gave this award in 1993 to honor Chief Chet Tharpe, who worked for Hillsborough County from 1971 to 1985 and served as Hillsborough County’s first Fire Marshal and Fire Chief. For more information on the Chet Tharpe Firefighter of the Year Award, go to www.hillsboroughcounty.org/bocc/about/awards.cfm?award=firefighter .